In the Nicosia Declaration, adopted on Tuesday after deliberations at the Southern EU Countries Summit, which took place in the Cypriot capital, the leaders of the seven Mediterranean member states also say that EU membership is the best safeguard for a reunited Cyprus. 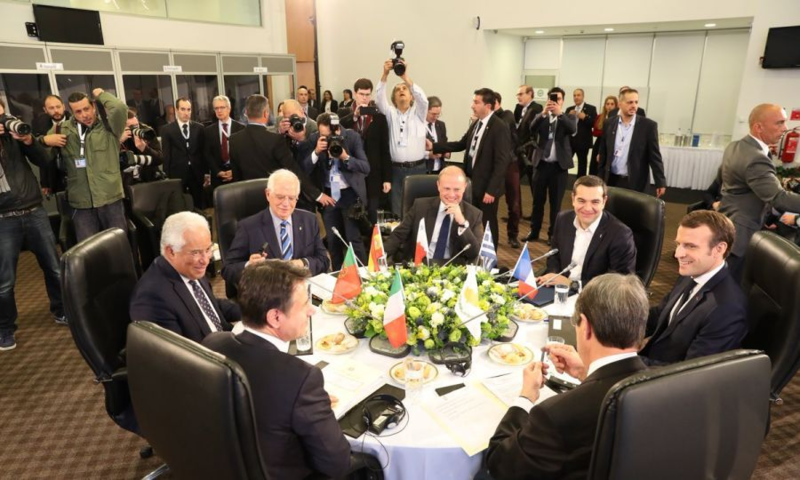 The MED7 Summit, hosted by President of Cyprus Nicos Anastasiades, was attended by the President of France Emmanuel Macron, the Prime Minister of Greece Alexis Tsipras, the Prime Minister of Italy Giuseppe Conte, the Prime Minister of Portugal Antonio Costa, the Prime Minister of Malta Joseph Muscat and the Foreign Minister of Spain Josep Borrell Fontelles. In the Declaration, the leaders reiterate, among others, their steadfast support on the ongoing efforts by the United Nations Good Offices Mission for the resumption of meaningful negotiations leading to a comprehensive and viable solution to the Cyprus problem in accordance with relevant UN Security Council resolutions and in line with the EU acquis, values and principles. Moreover, they comment the efforts of the government of the Republic of Cyprus to reach a solution, which reunifies Cyprus and its people, safeguards Cyprus’ sovereignty, independence and territorial integrity, free of foreign interventions, troops and guarantees. “It is of utmost importance that the EU remains actively involved in the negotiations upon resumption, in order to ensure that a reunited Cyprus remains a fully functional member of the Union, compliant with EU acquis” they say. The MED7 also lend their support to Cyprus hosting the European Labour Agency, which will enhance EU rules on fair labour mobility and will ensure their fair and effective enforcement. In this regard, they note Cyprus’ readiness to host the seat of the Agency in Nicosia. Moreover, they acknowledge the severe consequences of climate change in the world and in the southern regions of Europe and the Mediterranean basin, and pledge to shift to a low carbon model of economy. “Cyprus stands ready to assume a regional role to tackle climate change by promoting coordination and cooperation between the countries of the region, so that a targeted Action Plan is developed” they add. Leaders also say they remain committed towards completing the Energy Union. They note, moreover, that the Western and Eastern Mediterranean region is a strategic corridor for gas supplies and electricity through gas infrastructures such as the EastMed pipeline. They also reiterate their commitment to ensure the continued involvement of European companies in the area, while expressing their solidarity with the Republic of Cyprus in exercising its sovereign rights to explore, exploit and develop its natural resources within its exclusive economic zone, in accordance with EU and international law. Among others, they call on Turkey to normalize relations with the Republic of Cyprus and say that the lifting of Turkish restrictions in ports, airports and airspace towards Cyprus and EU companies related to Cyprus will also be beneficial for the whole region.